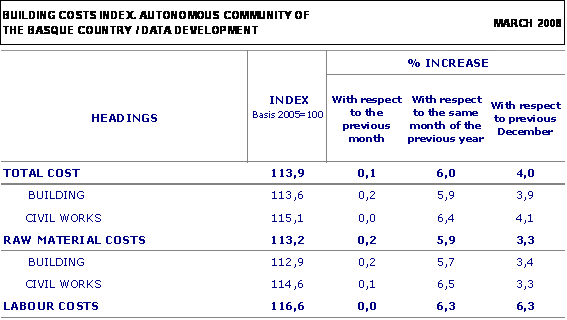 The Building Costs index in the Autonomous Community of the Basque Country registered an increase of 0,1% in March 2008 with respect to the previous month, as a consequence of which the inter-annual rate for that month reaches 6%, according to data facilitated by EUSTAT, the Basque Statistics Office. In the month of March 2008, labour costs did not vary at all (0.0%) whereas raw materials costs registered an increase of 0.2%. The Building and Civil Works subsectors registered a similar evolution, with a growth of 0.2% in Building costs over the previous month, whereas in the Civil Works subsector raw material costs increased by 0.1%. In the interannual evolution of those two subsectors it was observed that both registered increases albeit with different intensities: raw materials costs in Building grew by 5.7%, whereas Civil Works raw materials accumulated an increase of 6.5%. In the month of March, the highest price increases took place in the following raw materials used: Electronic material (1.8%), Metallurgy (1.1%) and Furniture manufacture (1.1%). On the other hand, a reduction in prices was observed in Electric power and gas (-2.5%), and non-metal industry (-0.8%). Among the prices of raw materials used by the sector that experienced the highest rates of inflation throughout the last twelve months are: Electric power and gas (14.6%), Non-metal minerals (11.9%) Water (10.9%) and Petrol refining (10.2%). On the other hand, interannual price decreases or lesser increases (March 2008 compared to March 2007) were observed in raw materials related to Electronic material (-2.2%) and Metallurgy (0.2%).